New home product development continues unabated. One spark of new products is at the intersection of energy saving and DIY. Another innovation leap-off point is leveraging smartphones. In short, there are a bevy of new products that are fun, smart and worthy of a few moments consideration. It is summertime in Minnesota. Some love to live with open windows and the natural breeze. Others enjoy keeping the temperature at very cold wintery levels. Either way, take a look at this air conditioner that can be made for $15. It uses a Coleman Cooler, check it out! This product from nest, a thermostat that learns, works based on your use and adapts to more efficient heating and cooling patterns. You use it like any thermostat when you are at home. You can also program it from your smartphone. So, if you are going to be away for an extra day you can adjust the temperature to conserve energy. This innovative product makes grilling time fun, and the time between beautiful. 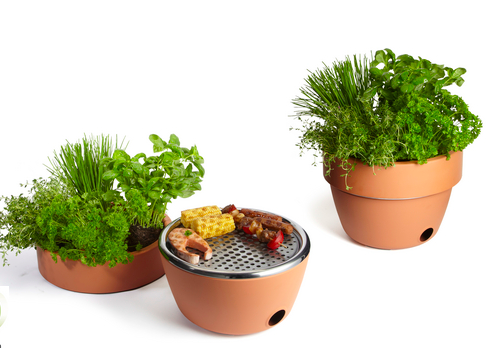 Available from Black+Blum, the hot pot, doubles as herb garden and grill. Grow basil in the grill's top and then use it on your grilled vegetables--it couldn't be any fresher.